Because of the challenges of posting while traveling (and hosting the trip), my hotel barging reports are delayed. 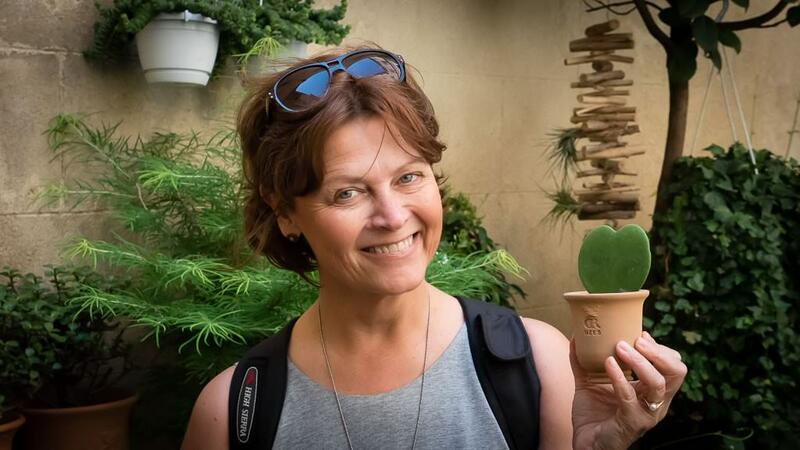 The trip took place on CroisiEurope’s Anne-Marie June 17 through June 26, with pre- and post-trip overnights and activities. 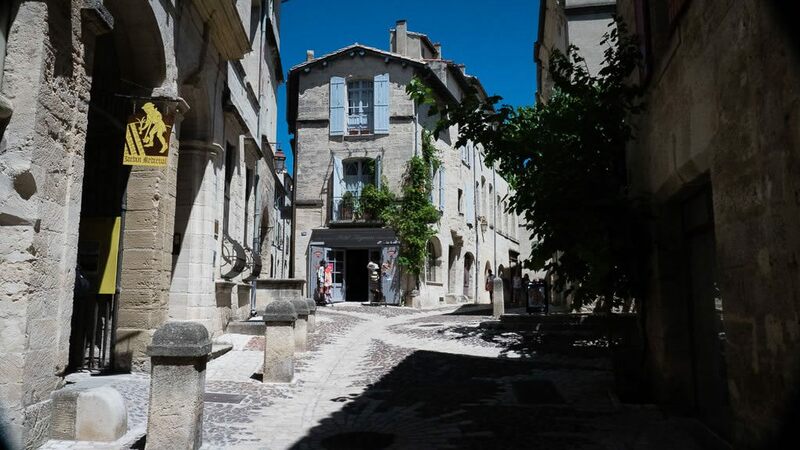 This post picks up on day two of our adventure, June 18, when we explored Arles and Uzes. 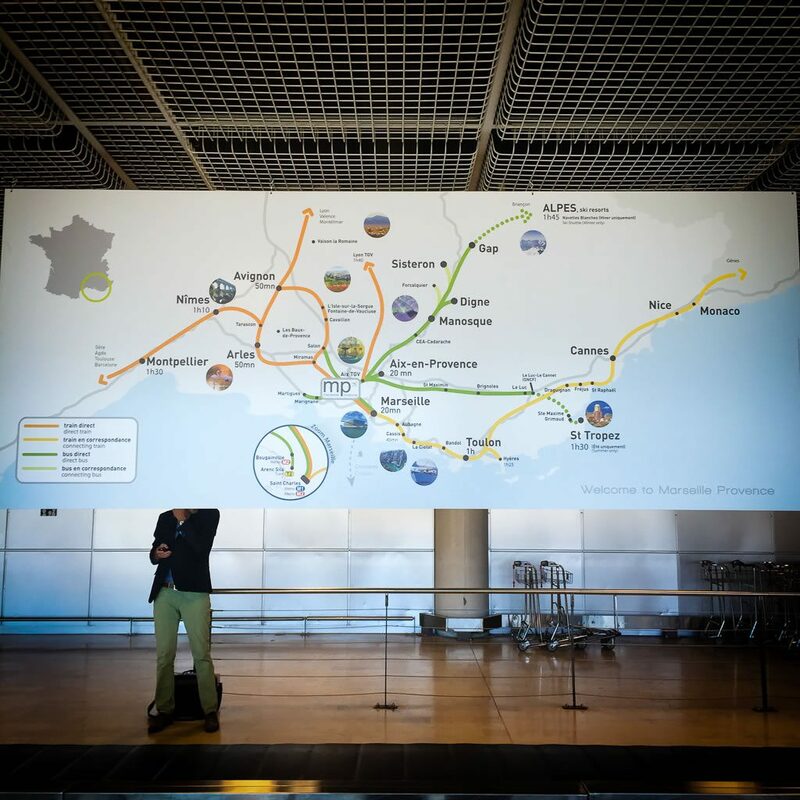 In my previous post about our barge trip from Arles to Sete, I wrote about missed connections and lessons learned when flying transatlantic from the United States to Europe. The challenges that the airports (particularly the U.S. airports) throw at us can be disheartening. Of course, Mother Nature plays a role, especially during the hot summer that we’re having, which makes for more frequent thunderstorms than under milder conditions and, correspondingly, delayed flights. The lesson: Plan accordingly and be prepared for interruptions to your trip. And so it goes that I made it to Arles a day late and a few hundred dollars poorer (because of a hotel room I had to pay for in the U.S.). It is lovely to be in Arles, though, well worth the minor hassles that airports and delays pose. I arrived around mid-afternoon yesterday and checked in to the Hôtel Jules Cesar, a five-star property housed in a former convent dating back to the 17th century. Our group would be here for two nights before boarding Anne-Marie on Friday. 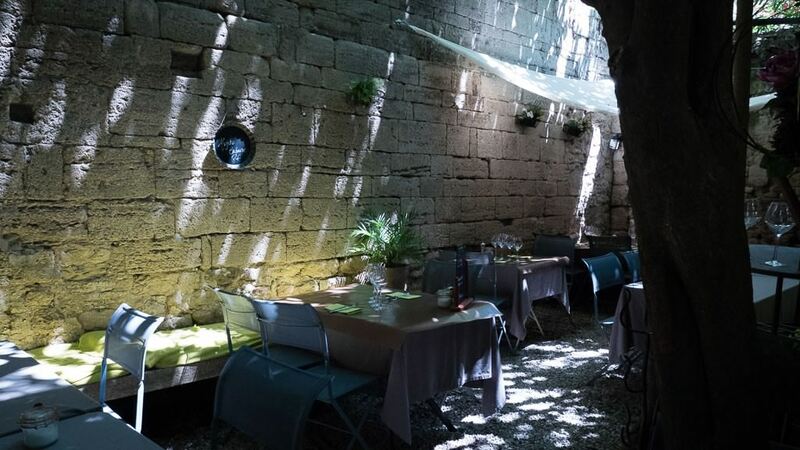 In the early evening, I welcomed the members of our group in a lovely courtyard where we toasted with glasses of French wine and introduced ourselves. We were comprised of seven Americans, two Australians and one Swede. 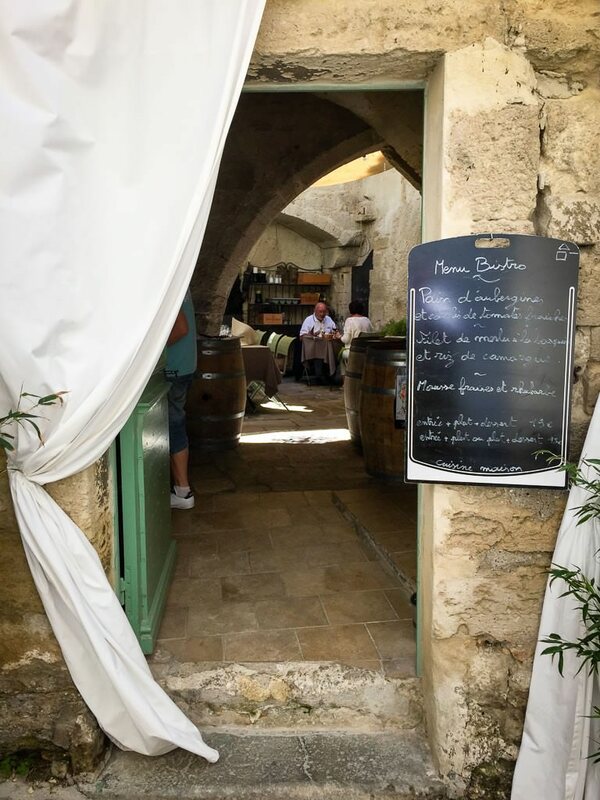 We talked about the days ahead and all that we would see, beginning with a full-day tour Friday when we’d explore Avignon, Châteauneuf-du-Pape and Pont du Gard, followed by our voyage along the Canal du Rhone-à-Sète on the barge, and then a post-barge night in Montpelier. Tomorrow was to have been a free day to explore Arles, but I had a surprise in store. I had rented a van for anyone who wanted to make an excursion. We had many choices but two came to mind. 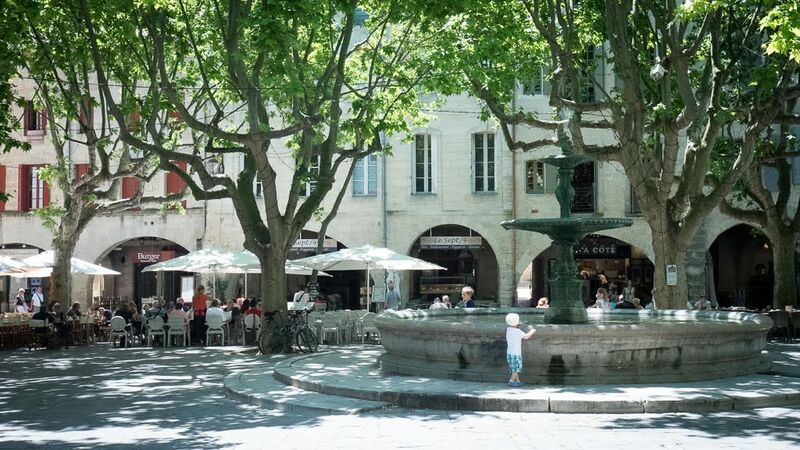 We could go to Aix-en-Provence, a favorite of mine (read more about Aix-en-Provence), or to Uzes, a gorgeous town that lies at the source a river where a Roman aqueduct was built in the 1st century BC to supply water to Nîmes, 50 kilometers away. The consensus was that we would go to Uzes. Who wanted to go? All hands shot up, and so with our plan for the next day set, we went our separate ways to seek out dinner. 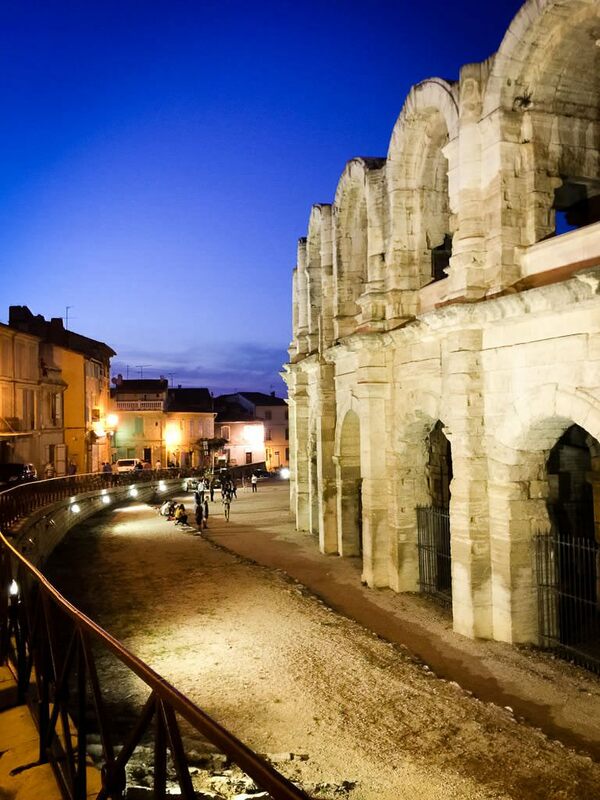 Monica and I dined near the walls of the ancient Roman arena in Arles. We could have been in Rome, such was the setting. It was a lovely summer night as we sat outside. She had risotto with mushrooms, and I opted for steak-frites. We ordered a half-carafe each of the house red and white. 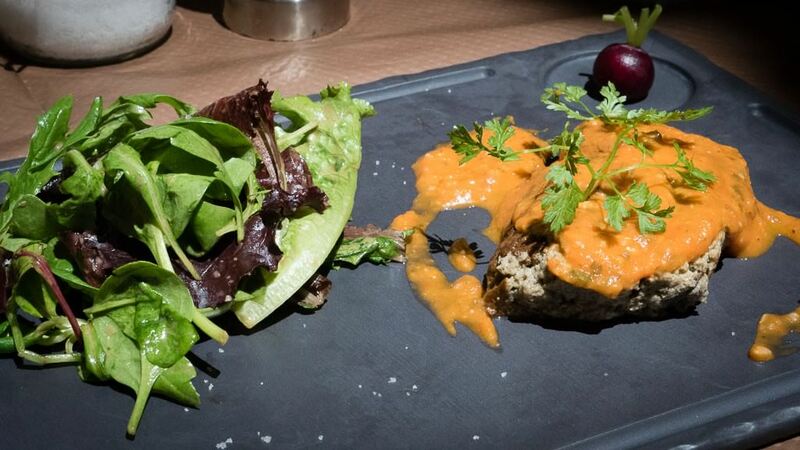 The food, wine, company and setting — all delicious. 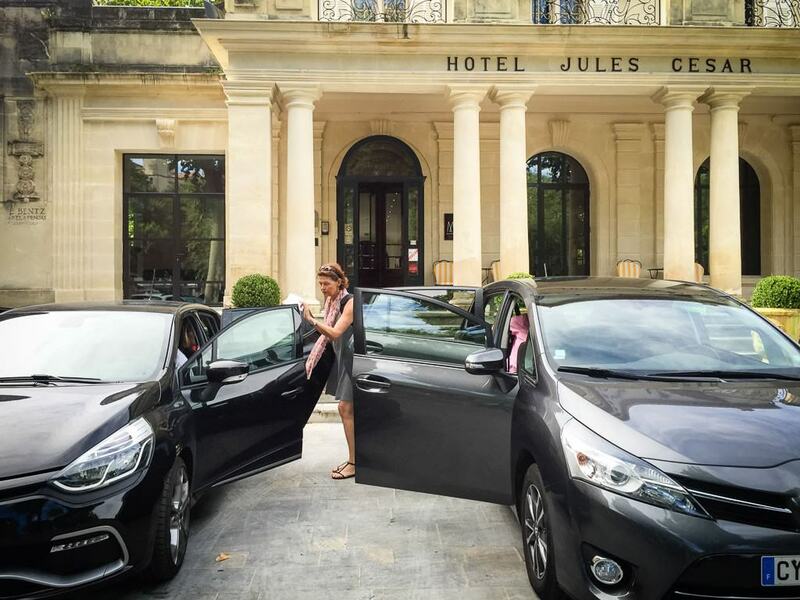 The next morning, after a hearty breakfast at Hôtel Jules Cesar, we prepared for our trip to Uzes. The van would only hold eight. Luckily, George and Connie, our token Australian couple, had rented a car. George volunteered take two guests and lead the way. The rest of the day is best said in pictures. We were off to a good start. 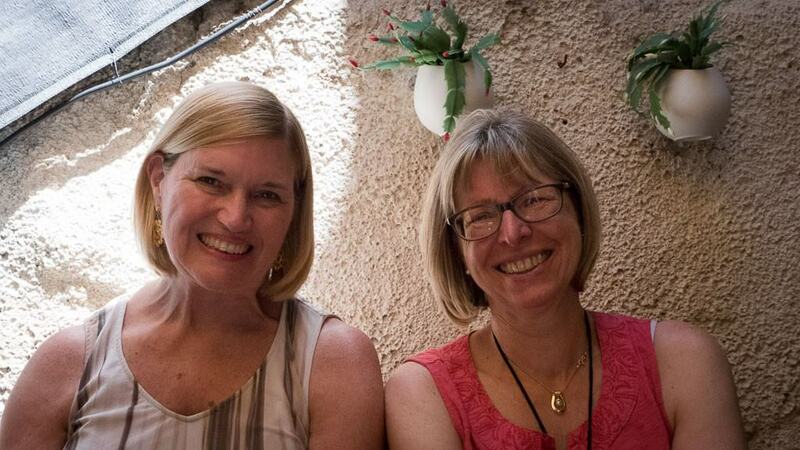 The trip to Uzes provided a chance for us to get to know one another and to have a lunch that we raved about. Plus, we got a bonus, really a double bonus. We weren’t planning to do this trip at all. Today was to have been a day to explore Arles on our own. 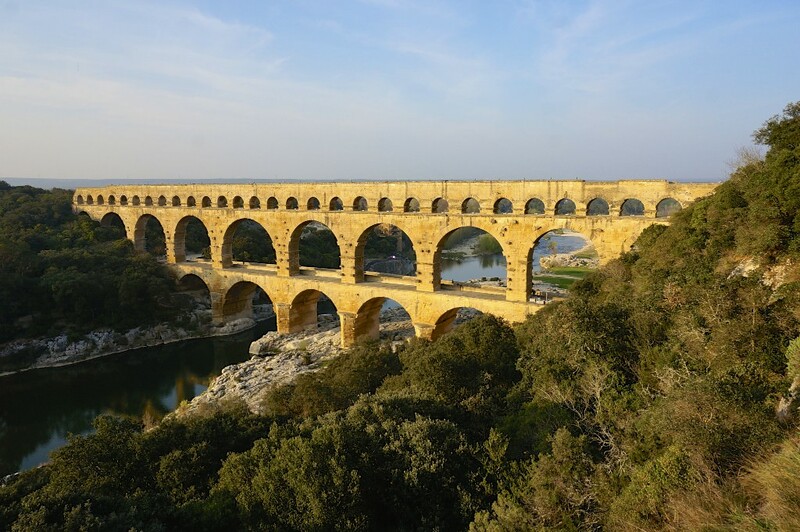 And our visit to Pont du Gard was to have been tomorrow, but as we would pass right by it, we decided to stop to visit the UNESCO World Heritage Site leaving Uzes. It was a good decision. The Romans were known for their incredible mastery of architecture and engineering. 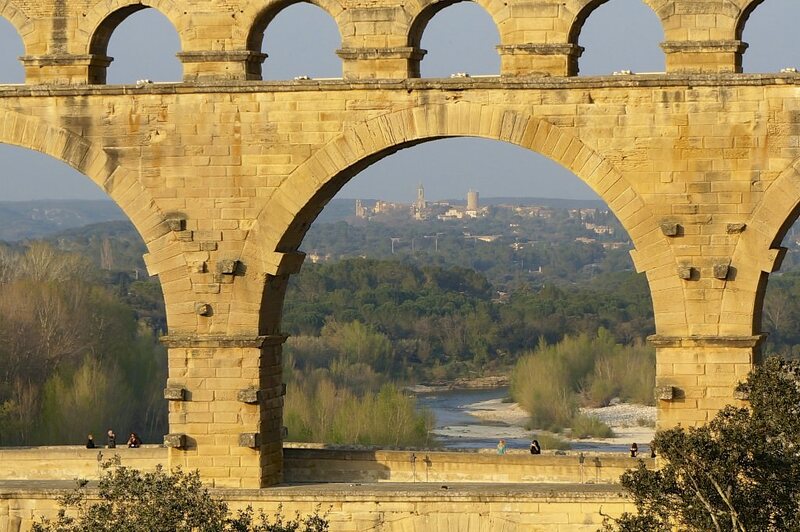 One of the most impressive samples of this mastery is the absolutely gorgeous Pont du Gard. This bridge, crossing over the Gardon River, is one of the most-well preserved legacies of ancient Roman architecture in France, and in all of Europe, in fact. 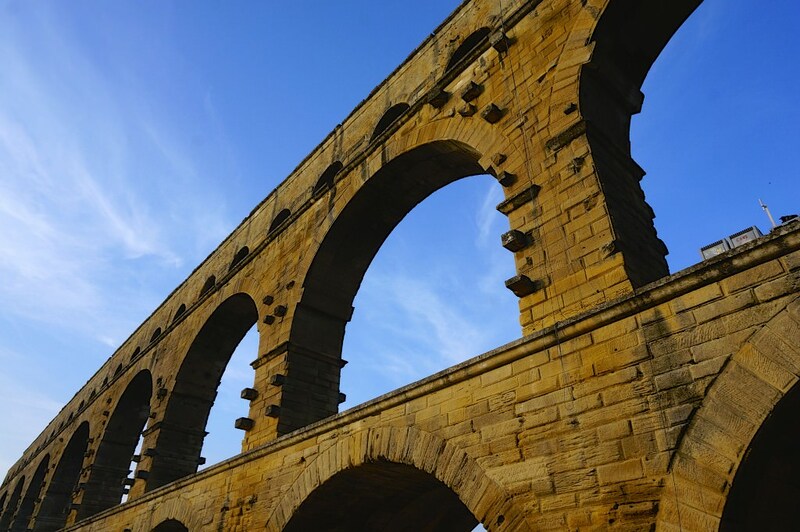 During the Roman Empire, the bridge was built as an aqueduct to provide water to the town of Nimes, which, because of its geographical location, formerly had complications getting a steady water supply. The water was taken from a nearby spring, traveling 31 miles to get to Nimes. Once in the town, the water was used for bath houses — which were popular in the Roman Empire — fountains, and in the houses of the wealthy. Luckily, the bridge did not suffer the fate of most Roman structures, which is to say that Pont du Gard was not left abandoned and in ruins. 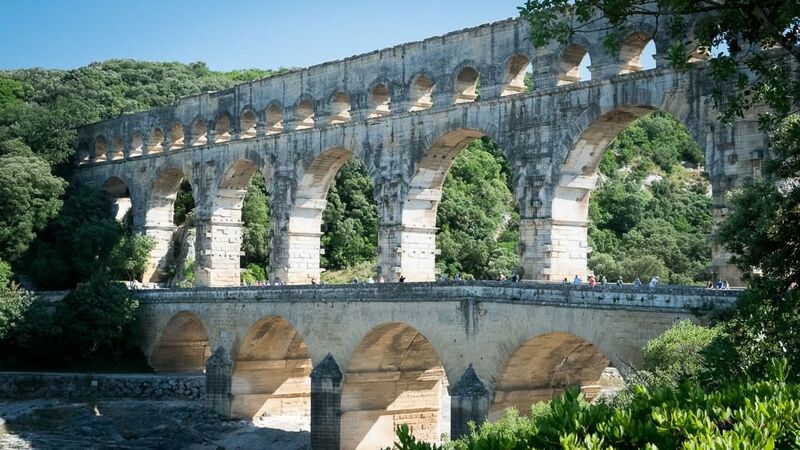 Though Romans used it mainly as an aqueduct, after the Roman Empire fell, Pont du Gard continued to be used as a bridge, which ensured its preservation. The bridge’s incredible beauty and awe-inspiring architecture also played a role in its preservation, as it became the object of visits by the French court, including several kings. Paintings of it can be found in palaces, such as Fontainebleau. It is not surprising, then, that the picturesque qualities of the bridge have also inspired writers such as Jean-Jacques Rousseau and Henry James. Nor is it a surprise that it has been named a UNESCO World Heritage Site, and that it is now one of the most popular sites in the entire county of France. 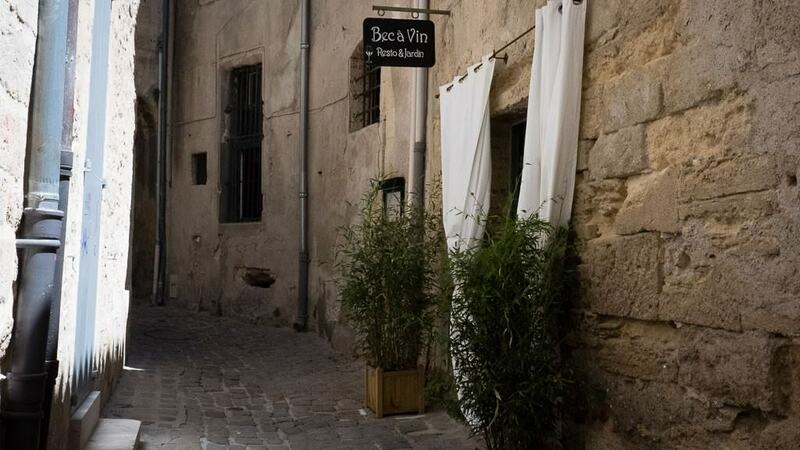 Tomorrow, a full day visiting Avignon and Châteauneuf-du-Pape. A bonus I didn’t expect when signing up for this trip – escorting/driving three delightful females on the drive to Uzes and Pont du Gard! And such a delightful host they had! Thank you for driving George!